Finally, the Calabria travel guide you’ve been waiting for! Beaches. Mountains. History. Culture. Legends. Superstitions. THE FOOD. From its gorgeous coastline, national parks, and fabulous festivals to its ancient ruins, cobblestone streets, and renowned cuisine, Calabria has got something for everyone. Michelle Fabio, author of the popular Bleeding Espresso blog, is the perfect virtual tour guide to help you make your way around the toe of the boot. Michelle has lived in Calabria for more than a decade and these are her picks for how you should spend your time there. 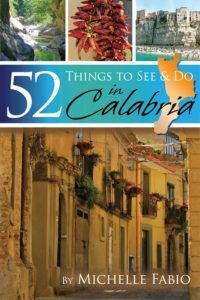 Whether you’re planning a trip or are a descendant of Calabria who wants to learn more about this ancient, beautiful land and all it offers, 52 Things to See & Do in Calabria — the only Calabria travel guide written by a local in English — is for you. These guides are specifically designed to be unconventional—starting with the authors. Unlike the vast majority of travel guides, Locals Know Italy books are written by people who live or have lived in the subject area and, most importantly, love it. By digging deep into the character of the place and veering from the predictable, our authors strive to help you get to know our homes as we have. The guides are written in a conversational but informative style so it feels like you’re tagging along on our morning errands, but oh look, an archaeological dig—and do you know the story behind that oddly shaped window? We want you to have as much fun reading our guides as we have writing them. We want these books to hold your interest even if you’re only armchair traveling. And most of all, we want these guides to inspire you to experience Italy in a way that helps you feel like a local for however much time you have here. As always, grazie mille for your support!